I'm writing this blog post because most people have no idea what I do for a living. Even some my closest friends and family don't really understand how I made blogging my full time job! 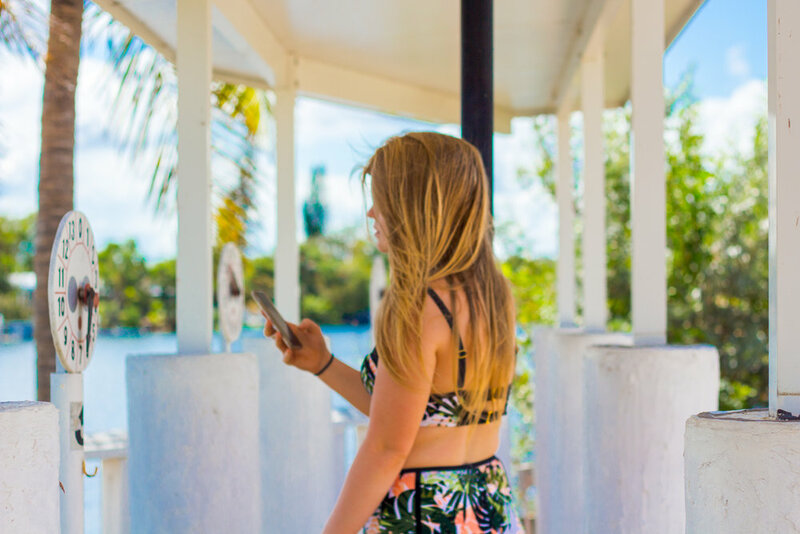 I hope that through this post I can answer a lot of questions about what it's like to work in social media marketing both on Instagram and blogging. So let's jump right in with what exactly I do! I create beautiful content for companies looking to advertise their products online, and I post that content onto my social media platforms. Some large companies that I've recently worked with include Google, Dr Pepper, Pampers, and Zevia. I also educate my audience on the importance of using these brands in their everyday life on my blog. Some of my most recent posts have been in collaboration with Dove (focusing on self-confidence in women), Munchkin (traveling with kids), and Osea (vegan skincare products). I also own BSL Consulting, where I consult bloggers and brands on how market their Instagram pages so they can be successful online. I develop friendships with my audience, network with brands from all over the world, and bring up other creatives looking to grow their platforms! It's seriously the best job. What does my normal day look like? My day begins with applying for campaigns. I apply for most marketing campaigns through networking sites, which are websites that connect content creators with companies. I am constantly checking at least ten different sites and pitching ideas/negotiating rates for social media advertising. I am also constantly talking on the phone and responding to emails from brands who are interested in marketing. A large part of my day is focused on creating content. I get products in the mail almost every day that I am required to take photos of and feature across my social media platforms. Our photoshoots can last hours depending on the location and what the products are. My husband takes all of my photos for me, and let me just say that Dev is an amazing photographer for just starting out! I then send the photos over to my editor Brady Pappas. Not only does Brady edit all of my photos for me, but recently he has become my campaign assistant and helps me create content for brands. Brady recently helped me with a campaign for Herbert's Lemonade. The photos he took are beautiful! Every day I post 1-2 ads on Instagram, and normally try to post a photo for fun as well. This takes a lot of time because I have to research the best hashtags and locations to increase my reach, along with creating a caption that fits my audience. On Instagram I also have to catch up on my pods, comments, DMs, and followers posts in order to stay engaged! I also work on campaigns daily on my blog. A normal blog post takes me around 3 hours from start to finish. Along with writing a blog post, I'm always making my website look better by changing tags and adding links, which is time consuming. Along with working on campaigns, I also have to keep my audience interested in what I'm doing on an everyday basis. Some ways I do this are by posting Instagram stories, going live, and posting things that interest my followers. My goal for BSL is to create a community of creatives that grow together, along with talking to moms about everyday motherhood. One way I try to stay engaged is by commenting back on my posts for at least the first hour after posting, and also always responding to DMs. I also run a consulting business on the side for creatives and companies. I teach social media influencers, creators, and bloggers how to work full time online and grow their platforms. I also talk to companies about how to grow their online presence, along with teaching them how to find influencers to market their product and increase their business's ROI. I love consulting clients because it allows me to talk to so many different types of people! For a lot of bloggers, doing all of this means staying up until 4 AM somedays to work on their blog only to wake up three hours later and take care of their babies. Most of us hardly ever sleep, because our job is not 9-5 its 24/7. We never really have time off. We are ALWAYS working. Even if we are on vacation, it's normally associated with our brand and we are required to go to events and work during our entire vacay. How much can someone make as a blogger? Just like a lot of bloggers, my blog & social media platforms provide for my whole family. I'm the breadwinner. I pay rent, bills, and all the little things with the money I make from my blog & Instagram. Yes, I'm not just getting free vacations and expensive watches (although those things are nice too!). I'm also sending my baby to the best preschool in the area, putting a roof over our head, and paying off my student loans. The salary of a blogger really does depend on their audience and how much time they spend working at it every day. The best part about my job is that I get to decide how much I work, and in turn how much I make every month. I also rarely have to buy anything; clothes, vacations, rental cars, date nights, and even food is covered most of the time by companies sponsoring us! We've gotten Aimery a new car seat, an entire nursery (crib, changing table, etc), books, toys, bottles, you name it. I love that my job allows me to provide for my family and give them things that I may not be able to give them while working a normal 9-5 job!